Everyone knows that James Cameron drew inspiration from the iconic “floating” pillars located in China’s Zhangjiajie National Forest Park as he created the “Hallelujah Mountains” that feature prominently in his 2009 blockbuster, Avatar. 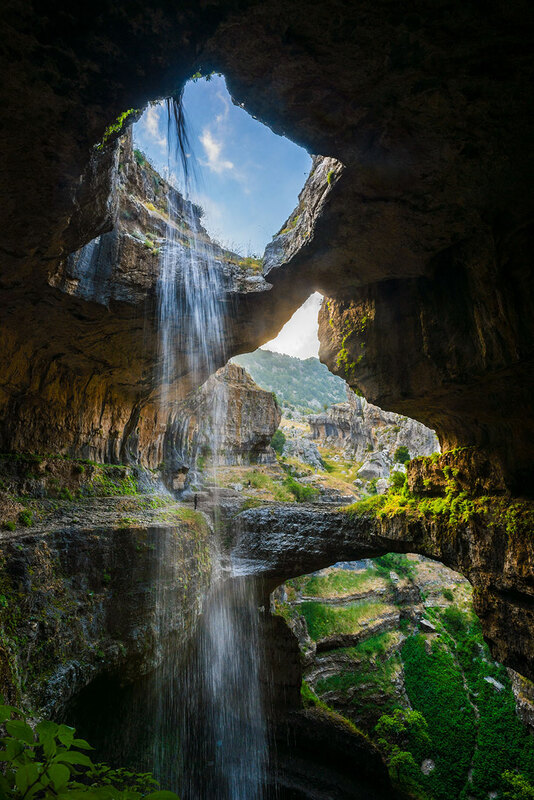 Baatara Gorge Waterfall is part of a prehistoric limestone cave that has been carved out by winter snowmelt from Mount Lebanon over millions of years. The cave is located in Tannourine, Lebanon along the Lebanon Mountain Trail and features an impressive 837-foot waterfall that drops from the cave’s ceiling down into a deep sinkhole that locals call “Baatara Pothole.” French bio-speleologist Henri Coiffait “officially” discovered the cave in 1952 and the Spéléo Club du Liban mapped out the whole system in the 1980s. If you ever get the chance to visit this wonder of nature in person, heed the many warning signs that have been posted around the expanse. Scientists have warned that the bridges, which look oh-so-tempting to explore, may collapse at any time under the weight of too many visitors!